"84 Charing Cross Road" opens November 9 at Savannah Community Theatre. 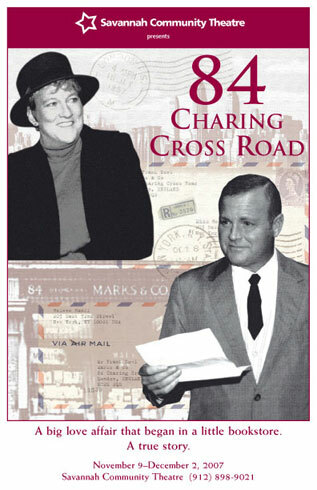 "84 Charing Cross Road” is the true story about the 20 year love affair between a feisty, passionate booklover (Reneé DeRossett) in New York and a reserved antiquarian book dealer (Jeffery Hall) in London, shared through overseas letters. Like the best love stories “84” is touching, funny, frustrating, and ultimately sad. Tickets on sale now! Call (912) 898-9021. Or buy tickets online now. Friday and Saturday evenings: 7:30 p.m.Nov. 9, 10, 16, 17, 30 and Dec. 1.